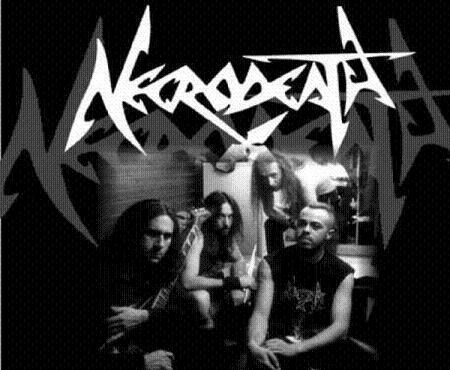 Necrodeath (1985-present) is a Black Metal band from Genoa, Ligury, Italy. nfluenced by Slayer, Possessed, Destruction, Kreator, Sodom, Bathory, Voivod and Dark Angel, Necrodeath released their debut 4-track demo The Shining Pentagram later that year that was followed by Into the Macabre and Fragments Of Insanity in 1987 and 1989 respectively. After ten years of silence, they would return under the leadership of Claudio (guitar), Peso (drums), John (bass) and Flegias (vocals) to release Matter Of All Evil (2000), a strong effort continuing their tradition that was followed by Black as Pitch in 2001. In 2002 they returned with the video From Hate to Scorn, and after a short break they were back in the studio 2003 for the September 2003 release of Ton(e)s of Hate with the compilation 20 Years of Noise 1985-2005 (2005) coming two years later. After 100% Hell (2006), Draculea (2007), Phylogenesis (2009) and Old Skull (2010), the compilation The Age of Fear would sum it all up in 2011. Between Idiosyncrasy (2011) and The 7 Deadly Sins (2014) there was a set of singles and splits. Headhunting EP (2015) and The Age of Dead Christ would be their 2015 and 2018 releases respectively. (Current): Peso (Real Name: Marco Pesenti; drums; 1985-1990, 1998-), Flegias (Real Name: Alberto Gaggiotti; vocals; 1998-), Pier Gonella (guitars; 2007-) and GL (Real Name: Gianluca Fontana; bass; 2008-). (Past - A large number of whom would be from Ghostrider): Paolo (bass; 1985-1990), Claudio (guitars; 1985-1990, 1998-2003), Ingo (vocals/guitars; 1985-1990), John (bass; 1998-2008), Andy (guitars; 2003-2006) and Maxx (guitars; 2007-2009).